By now we all know of Donald Trump’s executive order temporarily banning the entry of citizens from seven Muslim majority countries. According to his statement, it was “about terror and keeping” America “safe”, as his “first priority” is to “protect and serve” America. But simply banning the entry of people from these seven countries cannot guarantee the safety of Americans and will fail to bring an end to, or even minimise, terrorism. So what can he do? Former US Assistant Secretary of the Treasury for Economic Policy, Dr. Paul Craig Roberts, says that “the simplest way to end the refugee problem is to stop producing refugees” (The Left Is Self-Destructing, January 30). Similarly, ‘the simplest way to end terrorism’ then, would be ‘to stop producing terrorists’. Sadly, that is exactly what the US and its allies have been doing in Syria and elsewhere, prompting independent journalists en masse, various governments and others, to emphasise the need for the US to stop supporting terrorists who are destabilising the Middle East especially, but other regions too. And in the process, worsening the refugee crisis and increasing terrorism across the world. She said that every person she spoke to said the same thing, without hesitation, that there are “no moderate rebels”. That “the Syrian people recognise and they know that if President Assad is overthrown, then al Qaida — or a group like al Qaida…will take charge of all of Syria” (Just Back From Syria, Rep. Gabbard Brings Message: ‘There Are No Moderate Rebels’, cnsnews.com, January 26). And that is why “they are pleading with the United States to stop supporting these terrorist groups” and let Syrians decide their own fate. To honour their request, Ms. Gabbard recently put forth a bill in Congress called the “Stop Arming Terrorists Act”, to prevent the US government from using its taxpayer dollars “to directly or indirectly support groups allied with terrorist groups such as ISIS and al Qaeda in their war to overthrow the Syrian government”. To gain support for her bill, Ms. Gabbard also met with President Trump, who, according to her, responded well to her message. 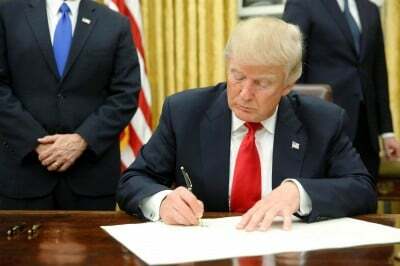 Now, the best way that President Trump can really fight terrorism is by ending US support to terrorist organisations in attempt to overthrow foreign governments and, instead, back the ‘Stop Arming Terrorists Act’. This, however, will not be easy. According to Ms. Gabbard, she is facing immense bipartisan pressure from both the Democrats and Republicans for her stance against the US’ longstanding policy of instigating regime change in foreign countries. Should Trump decide to follow her advice, there can be no doubt that the same will happen to him. However, if President Trump is truly sincere about taking a stand against the ‘establishment’, like he said he would during his campaign and in fighting terrorism, this is exactly what he must do. But this alone won’t be enough. He must also convince the US’ allies such as Israel, Saudi Arabia and others, to not support these extremists groups and to stop directly intervening in countries like Yemen. And if dialogue fails, President Trump must reverse Obama’s policy of providing record breaking quantities of armaments to the likes of Saudi Arabia and others, as without US weaponry, these countries cannot wage their wars of aggression. During his presidential campaign and after, President Trump also expressed his desire to work with Russia to end the Syrian crisis. All the while the US worked towards bringing about regime change in Syria, Russia valiantly provided support to the Syrian government, humanitarian aid to the Syrian people and tried its best to find a political solution despite being repeatedly demonised for it. Now that he is in office, President Trump should immediately look to work with Russia, rather than against her, as his predecessor’s administration did. Given the possibilities, the good news is that President Trump can do a lot to end terrorism, ensure security for Americans, all the while saving the US a lot of money that would otherwise be wasted on foreign incursions. The bad news, he will have to take on the entire US government-industrial-complex to succeed and even if he has the courage to take on that challenge, there is no guarantee of success, given the power that it wields. But that aside, the most important question for now is, is he going to follow through with his promise of taking on the establishment, and stop waging “stupid wars”? Whatever the answer is, will be the most important determinant on how successful President Trump is in saving American lives and, also very importantly, the lives of many others. Eresh Omar Jamal is an Editorial Assistant at The Daily Star, Bangladesh, the largest circulating English daily newspaper in Bangladesh. He has a Specialised Honours in Financial and Business Economics from York University, Canada, and can be reached at [email protected].